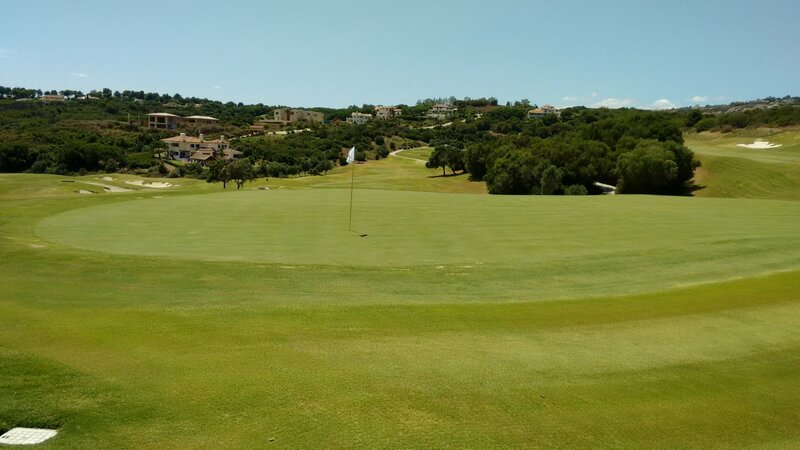 This club sits within the Sotogrande complex,and was built quite recently – in 2004. The clubhouse is large and fairly austere. Needs some things to make it warmer and more hospitable in my view – some plants, creepers, pergolas perhaps. The service everywhere (golf and clubhouse) was very attentive and helpful. The hamburger I had there was nicely cooked exactly as I ordered it. The clubhouse is split over two levels and has ample parking. There is a large driving range right of the clubhouse and a good practice putting green immediately in front of the clubhouse. The course is big and generally flat. Rated by some as among the top 10 golf courses in all of Spain. Fairways have lots of gentle undulations and bumps, but no significant elevation (up/down long the fairway towards the green). Similarly, most long holes have medium slope (left/right across the fairway), but nothing severe. Fairways and tee boxes have very high quality grass. The fairways are some of the best of any I have ever encountered on the Costa del Sol. About 11 holes have another fairway near by. Not very close by - because this is a quality, non-cramped golf course - but worth noting for the following reason: Between adjacent fairways there is usually a low ridge with well-cut grass and trees that are still quite small. If you miss a fairway and your ball ends up on one of those ridges, it is very easy to play out of. 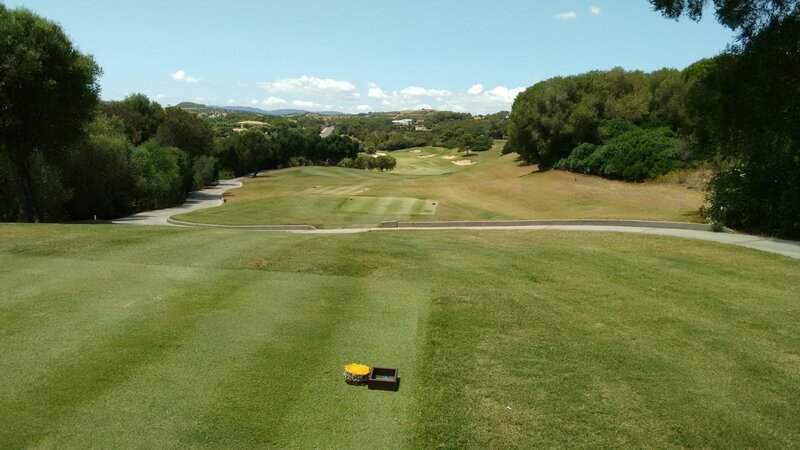 There is wild rough (the original scrubby Mediterranean vegetation) around the well-built concrete buggy paths, but not much of that dense rough where your ball can easily end up. So if you are off line along the fairway, the hazards that you really need to worry about are designed features – water and fairway bunkers. 7 holes have water hazards in play – large lakes alongside fairways in particular. Those lakes have no surrounding reeds, so your ball is either dead (in the water) or reasonably playable (approached the water hazard but did not fall into the water and you have an unrestricted swing of your golf club). The bunkers on this course are mostly large, blob-shaped, steep-sided with flat bottoms. Sand quality is good – coarse-grained and consistent to play out of. There are a lot of fairway bunkers (the main hazard along the fairways up to the greens). Bunker positions round the greens are quite challenging i.e. large bunkers close to the edge of the green. Half the holes have one or more bunkers directly in front of the green. This is a long course (the par 4s average 360 meters, the par 5s average 460 meters), so those bunkers in front of greens are a serious challenge for a long approach shot. Most greens are raised by a meter or two, and 4 holes also have a quite deep hollow just before the green. All these elements are designed to penalise you if your approach shot slightly misses the green. The greens themselves are large and quite flat – small undulations but no tiers. The greens are very high quality - very good substrate to the greens, high quality grass tightly mowed. I thought the greens medium-paced, not really fast at all, easy to read and very receptive (approach shots held up well on the soft greens). So once you are on the green, things are quite easy – maximum 2 putts on every green is a definite target. 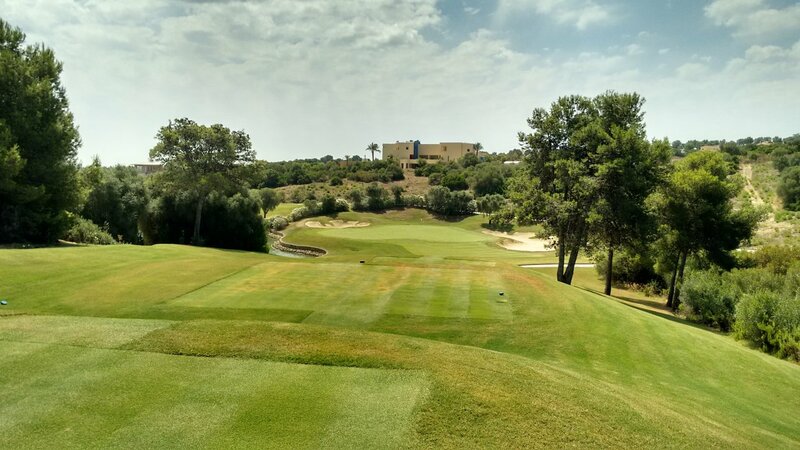 La Reserva is designed by Cabell Robinson (the same designer for Finca Cortesin, La Cala and Valle Romano). I think his designs are modern, sophisticated and take the best advantage of the natural landscape. Always a pleasure to play. La Reserva in my view is absolutely championship quality, but perhaps not quite a true championship challenge. This is a good course for 15-25 handicap players. They can get a reasonable score here, unlike other tougher courses where they will always struggle to play near their handicap. I can not recommend La Reserva to higher handicap players (30+ handicap) because of the length of the course and accuracy required on approach shots. Low-handicap players I think will find La Reserva quite easy. As a mid-handicap player, I personally like La Reserva a lot. A good course for me to try to play well, rather than a course where I am being more cautious. I think the fairways are wide enough for me quite easily to avoid fairway hazards, I understand how important approach shots are on this course and I have enough confidence in my putting to get down in 2 putts on the easy greens. A few final notes: There are no hole maps on tee boxes at La Reserva. Most holes are quite straight or gentle dog legs and the course is quite flat. So off the tee you can always see the green you are heading towards or otherwise the line is obvious. Even so, to my mind it costs so little to put up hole maps and average golfers really appreciate them, I think all courses including La Reserva should make the investment to put up decent hole maps. Also the signage on the course in some places is still quite poor. They need to put up more 'Next tee' signs where golfers really need them – immediately off a green you have just finished playing and at the junctions of concrete pathways. These are relatively minor points. La Reserva is still quite a young club. Perhaps they will make those investments in the future as the course matures. This club is making a lot of effort to keep up the quality of the golf course and the hospitality experience. It is a real pleasure to play any golf course like La Reserva. La Reserva is the yellow dot. That shows the course is 'Top 5' on the Costa del Sol both in terms of length and difficulty. An 18-handicap player can expect to play this course at about 22 over par. Premium courses like this typically set up the Competition tees (typically White) to be a lot harder.